In a televised address on September 17, 1980, president Saddam Hussein stood before the National Assembly of Iraq and condemned the neighboring state Iran. Hussein accused Iran of continuing to support the Kurdish insurgents that beset his regime, in violation of the shared 1975 Algiers Accord that ensured their cessation. The agreement promised to settle the border dispute over who rightfully owned the Shatt al-Arab waterway and to resolve the Kurdish insurgency in Iraq. The Iranian government post-revolution continued to allow Kurdish belligerents to seek refuge in their country, despite the 1975 agreement. Hussein made no effort to conceal his distrust in Iran. “[T]he rulers of Iran have violated this agreement as of the beginning of their reign by blatantly and deliberately intervening in Iraq’s domestic affairs by backing and financing, as did the Shah before them, the leaders of the mutiny [Kurdish leaders],” he declared. “I announce before you that we consider the 6 March 1975 agreement as abrogated from our side.” He technically had no such authority to singlehandedly revoke the international agreement; but Hussein nonetheless produced the official copy of the Algiers Accord, and, as the world watched on, he raised it in the air and tore it to pieces. Five days later, Hussein ordered Iraqi forces to overtake the Shatt al-Arab waterway and invade Iran. Despite this harsh reality, the war passed by with little public attention from the Western world. That is not to say that foreign and Western influences did not contribute to the conflict; the U.S. came to quietly but unambiguously favor Iraq. By providing military support and intelligence data to Saddam Hussein and his military, the U.S. sought out a resolution where Iran’s Ayatollah Ruhollah Khomeini and his religious zeal would not prevail in the Middle East. At the same time — as scandalously revealed in the 1985 Iran-Contra affair — the U.S. government under Reagan would still arm and negotiate with the supposed “terrorist state.” There is no simple explanation for America’s conflicting actions, and the superpower played an integral though contradictory part throughout the Iran-Iraq war. Its actions — even if unsanctioned as in the Contra case — benefitted neither Iran nor Iraq long-term, but rather the U.S. itself and its material interests in the Middle East. Ultimately, American involvement exacerbated the already bloody conflict of the Iran-Iraq war and further contributed to lasting political insecurity in the region. Iran’s support of the Kurds were just one part Saddam Hussein’s concern. By the time of the 1980 Iraqi invasion, a year and a half had passed since the realization of the Iran’s popular Islamic revolution and the return of Ayatollah Ruhollah Khomeini. In establishing himself as Iran’s religious authority and Supreme Leader, Khomeini had also extended his desire for religious revolt beyond Iran’s Shi’a majority. Publicly, he called upon the people and army of Iraq to “turn their backs on the Ba’ath regime and overthrow it.” In Khomeini’s view, Saddam Hussein and the “infidel Ba’ath party,” were enemies to Islam. Where Khomeini saw an opportunity for political reform through religious revolt in Iraq, Hussein saw a direct and violent threat to his secular regime. Moreover, Saddam Hussein aspired to extend his leadership over the greater Arab world, just as Khomeini sought to with Islam. The two were fundamentally opposed, both politically and personally. Saddam Hussein took the Ayatollah’s threats at face value. He saw conflict as both necessary and inevitable in the wake of Iran’s newly established theocracy. A calculated strike sooner rather than later, he postulated, would be strategic. “It is more useful to hit [the Iranians] now because they are weak,” says a quote attributed to Hussein. “If we leave them until they become strong, they will overrun us.” Without question, he had been misinformed. While Hussein had planned a Blitzkrieg attack to take Tehran in its revolutionary chaos, Iraqi forces were met with the same fervent nationalism that Khomeini had originally inspired. To Hussein’s surprise, rather than rejecting Iranian revolutionary ideals when presented with the Iraqi alternative, Iranians rallied around them. Saddam Hussein envisioned a swift victory, in the manner of Israel’s expedient June War of 1967. Instead, he quickly lost all that he had won in the initial invasions. The conflict launched would become the longest conventional conflict of the twentieth century — a “dreary war of attrition” that cost hundreds of billions of dollars and half a million lives. As early as the summer of 1983, Iran had reported Iraq’s use of illegal weapons, but their calls for a U.N. investigation found little support. The U.S., early on, was aware as well; one internal memo to Secretary of State George P. Schultz read that Iraq had employed poison gas “on almost a daily basis.” That same memorandum noted: “We know that Iraq has acquired a CW [chemical weapon] production capability, presumably from Western firms, including possibly a U.S. foreign subsidiary.” The State Department argued that it was the U.S.’ obligation as a signatory of the Geneva Protocol to at very the least to publicly condemn Iraq’s transgressions. However, the national security directive that followed — issued in November by President Ronald Reagan — neglected to mention chemical weapons at all. The prevailing priority became clear: Iraq was to win the war in order to defeat the anti-American, revolutionary, and religious zealotry that the Ayatollah Khomeini embodied. To the Reagan administration, an Iranian victory would further the Ayatollah’s aim of exporting Islamic revolution throughout the Middle East and thus destabilize local monarchies — a threat to the Gulf oil that the U.S. depended on. Until it had become far too late, the U.S. did not condemn Iraq’s human rights violations and use of chemical weapons. The Rumsfeld envoy, sent to further improve U.S.-Iraqi relations that following December, demonstrated this lack of pressure. Donald Rumsfeld had been flown to Baghdad as a emissary to the Reagan administration, hand-delivering the president’s genial message to Saddam Hussein. No mention of poison gas in battle was made, nor did the envoy acknowledge the death squads and torture employed in interrogation methods of his regime. Rather, Rumsfeld smiled in a photo-op as he shook hands with Hussein, and he reassured him that America too shared Iraq’s “understanding of the importance of balance in the world and in the region.” A former senior U.S. Defense Intelligence officer later acknowledged that, at the time, “[t]he use of gas on the battlefield by the Iraqis was not a matter of deep strategic concern… We were desperate to make sure that Iraq did not lose.” The U.S. would not publicly denounce Hussein’s use of chemical weapons until at least six months after it had been made aware. The State Department was forced to intervene after an American company had been found shipping 22,000 pounds of phosphorus fluoride, a component in chemical weapons production. However, issues emerged as under Reagan, the U.S. began pursuing both conflicting policies simultaneously. In 1984, the the U.S. restored full diplomatic relations with Iraq after the positive meeting of Rumsfeld and Hussein. It was later revealed to the world’s shock that in 1985, the U.S., using Israel as an intermediary, had supplied millions of dollars worth of arms to Iran in secret. With the aim of convincing Iranian officials to secure the release of American hostages in McFarlane had flown to Tehran to meet with Iranian officials. The fallout and later exposure became known as the Iran-Contra scandal, for having diverted profits from the Iranian sale to the Contras, a rebel group in Nicaragua. Historian Avi Shlaim has described the the Reagan administration’s contradictory policies during the Iran-Iraq war as “secretive, erratic, and unconstitutional… a sorry tale of floundering and blundering, of dishonesty and deception, of expediency and myopia.” Unconcerned with the roots of the conflict and Iraq’s atrocities, the U.S. worked in short-term self interest. A fear of Khomeini’s Islamic fundamentalism and the U.S. desire for continued access to Gulf oil ultimately informed the constantly shifting policies. The final result was a stalemate in the Middle East; neither state had gained control of any of the other’s land by the time they had been exhausted into a peace treaty in 1988. 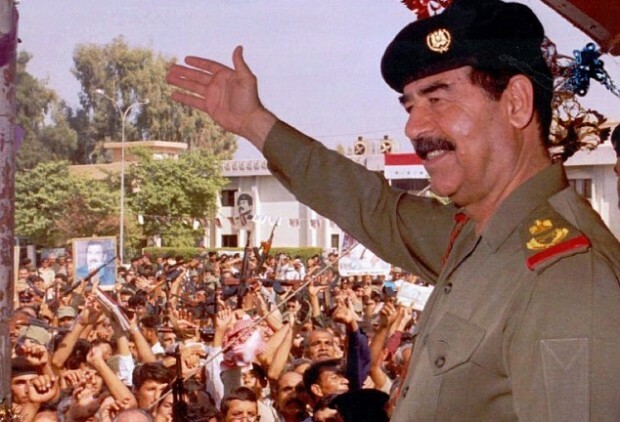 Today Saddam Hussein is viewed with “nearly hysterical criticism,” as historian William Cleveland notes. Cleveland also contends that we must confront the fact that the U.S. was crucial in Hussein’s atrocities in 1980s war. Without any international outcry in the wake of Iraq’s use of chemical weapons, Iran was left disillusioned and even more distrusting of the U.S. and the Western world. Ultimately, the Iran-Iraq war is violent, painful case-study in American intervention in the Middle East. The actions of the U.S. not only extended the war, but also further propped up Saddam Hussein. The U.S. intervention during the Iran-Iraq war fomented insecurity throughout the Gulf region that persists today. Adib-Moghaddam, Arshin. A Critical Introduction to Khomeini. Cambridge: Cambridge University Press, 2014. Al-Marashi, Ibrahim, and Sammy Salama. Iraq’s Armed Forces: An Analytical History. London: Routledge, 2008. Cleveland, William L., and Martin P. Bunton. A History of the Modern Middle East. 5th ed. Boulder, CO: Westview Press, a member of the Perseus Books Group, 2013. Gettleman, Marvin E., and Stuart Schaar. The Middle East and Islamic World Reader. Revised and expanded. ed. New York, NY: Grove Press, 2012. Holden, Stacy E. A Documentary History of Modern Iraq. Gainesville: University Press of Florida, 2012. Humphreys, R. Stephen. Between Memory and Desire: The Middle East in a Troubled Age. 2005 ed. Berkeley: University of California Press, 2005. Lando, Barry. Web of Deceit: The History of Western Complicity in Iraq, from Churchill to Kennedy to George W. Bush. New York: Other Press, 2007. Potter, Lawrence G., and Gary Sick. Iran, Iraq, and the Legacies of War. New York: Palgrave Macmillan, 2004. Digital file. Ramazani, Rouhollah K. Revolutionary Iran: Challenge and Response in the Middle East. Baltimore: Johns Hopkins University Press, 1986. Shlaim, Avi. War and Peace in the Middle East: A Critique of American Policy. New York: Whittle Books in association with Viking, 1994. Yetiv, Steven A. The Absence of Grand Strategy: The United States in the Persian Gulf, 1972-2005. Baltimore, MD: Johns Hopkins University Press, 2008. William L. Cleveland and Martin P. Bunton, A History of the Modern Middle East, 5th ed. (Boulder, CO: Westview Press, a member of the Perseus Books Group, 2013), 432. Rouhollah K. Ramazani, Revolutionary Iran: Challenge and Response in the Middle East (Baltimore: Johns Hopkins University Press, 1986), 61. Dilip Hiro, The Longest War: The Iran-Iraq Military Conflict (New York: Routledge, 1991), 39; Ramazani, 61. Cleveland, 432; Stacy E. Holden, A Documentary History of Modern Iraq (Gainesville: University Press of Florida, 2012), 230. Lawrence G. Potter and Gary Sick, Iran, Iraq, and the Legacies of War (New York: Palgrave Macmillan, 2004), 2, digital file; R. Stephen Humphreys, Between Memory and Desire: The Middle East in a Troubled Age, 2005 ed. (Berkeley: University of California Press, 2005), 144. Avi Shlaim, War and Peace in the Middle East: A Critique of American Policy (New York: Whittle Books in association with Viking, 1994), 80. Steven A. Yetiv, The Absence of Grand Strategy: The United States in the Persian Gulf, 1972-2005 (Baltimore, MD: Johns Hopkins University Press, 2008), 57. Barry Lando, Web of Deceit: The History of Western Complicity in Iraq, from Churchill to Kennedy to George W. Bush (New York: Other Press, 2007), 35.